The camera is my curtain. I am behind it. On the other side, on the grand stage of the world, the theater of life plays without intermission. I wait, listening to the dialog and watching the players move through the certain. Then comes a moment and I open the curtain, quickly and with such delicacy that the actors and the audience don’t recognize my presence. When the instant is gone, so am I, but I leave with the moment wrapped in my curtain. Photography teaches me patience, me, someone who is anything but patient. The moment will arrive when it happens and if I am ready, if I am looking and listening, and if I have been able, through stillness or persistence, to remain close even as I become bored or nervous or frightened, then I will have a chance to make a picture. Without patience, I have no chance. Without waiting, good pictures don’t happen – at least for me. Without the curtain, I am exposed and cannot wait. You see the circle now. The curtain protects. The protection comforts. The comfort makes me patient. The patience brings the photograph. Recently, I was in a bar in Bolinas. For a long time I just talked with the others who were there – with the bartender, with a woman who had brought home-made cheesecake, and with a pool-player who had one eye filled with blood, the consequence of a mountain bike mishap. The bartender invited me behind the bar. I faced a young blond woman, thin, animated and dressed in a spring party dress. She posed for the camera again and again. When she became bored, she stopped and slid a lipstick tube out from her purse. She lifted her gold iPhone and, using it as a mirror, refreshed her face. My waiting was over. The curtain opened. 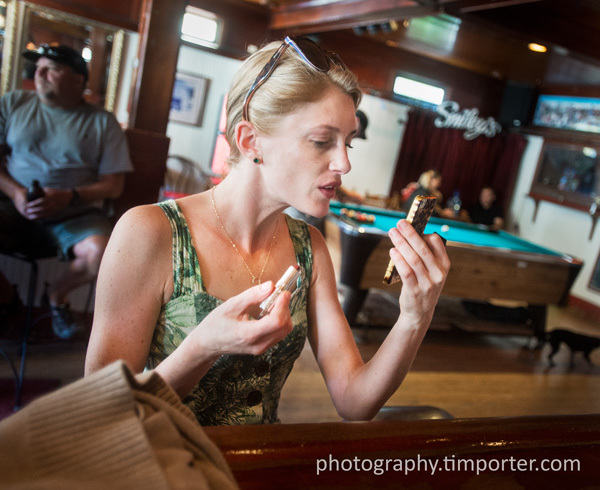 This entry was posted in Photography and tagged bar, Bolinas, lipstick, Smiley's.